Xen tan is one of the most talked about tanning brands, with so many recommendations I had to try... It's the logical thing to do :), so I purchased some last month and have been experimenting. Xen Tan's Luxe formula claims to deliver an ultra sheer instant colour and the fresh scent of vanilla whilst releasing an extra intense boost of deep olive colour meaning you can tan during the day and look great as soon as you apply… and it lasts up to 7 days. COLOUR - It doesn't deliver an instant tint, the colour blends out to nothing which doesn't alter my complexion. It takes about 1-2 hours for me to notice a natural looking olive tan, not even the slightest hint of orange. SCENT - It smells like vanilla on application, then the scent disappears and once the tan has developed it has the horrid fake tan smell. APPLICATION - When applying with my hands, I have to wash them after each body part as the colour stains my hands, using a tanning mitt is the best option which works well. Drying time is a few minutes as the product sinks right in leaving no sticky or oily residue. PERFORMANCE - It lasts about 4-5 days and I have never had it going streaky on me, it does go ever so slightly patchy at the end but not as bad as other tanning options I have tried. Reapplying once a week with regular exfoliating will keep you tanned for as long as you want. Overall I love the initial vanilla scent, but hate that it disappears.. I really wish that it still smelt like that even after the tan had developed. The best smelling fake tan I have used has to be the Garnier gradual spray tan. I do however LOVE the colour that 'Xen Tan Deep Bronze Luxe' gives, it looks SO natural as it has olive undertones, see picture below in direct sunlight. It just looks like a better version of my natural complexion. I use this one on my face as well as my body. Price: £20.95 at Beauty Bay RRP £25.95 (236ml) check Xen Tan for more information. Would I recommend? Yes, but I'm not sure it lives up to the hype. I do like it, I probably will repurchase, I certainly prefer it to St Tropez. I also ordered the Xen Tan Mist Intense at the same time which I haven't tried yet, so I will see how that goes. But, overall I am happy. Have you tried Xen Tan? Do you know if they sell this anywhere else? like online or something? 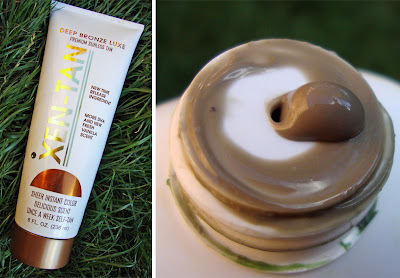 I can only find St. Moriz, but not Xen Tan :( I really want to try this and I cant find this product anywhere in Canada. i am so light this summer compared to everyone else, i can't stand it anymore! great review. i am really liking Sublime Bronze right now but I am always open to trying new things. This might work well for me because I have an olive skin tone to begin with. i'm going to give it a try. p.s your skin is flawless! Thanks for this review! I've been trying all sorts of self tanners lately, but I haven't found the right one yet. I havent tried zen tan as i am soo pale and worry this one is extremely dark! Looks good on you though, i wish i had naturally olive skin! Looks totally natural on you, I do agree witht he smell how can they say it has no 'fake tan smell' of course it does just masked with vanilla lol! You just look stunning as usual. The tan, that make up look and the hair colour really suit you! This looks beautiful on you. OMG Lollipop26 (Laura) did a review on this as well It must be good. I'll give it a whirl and let you know. I havent tried xen tan but I would love to know why you prefer it over san tropez since that one seems to have quite a following!